Author: Dezenhall, Eric Set In . 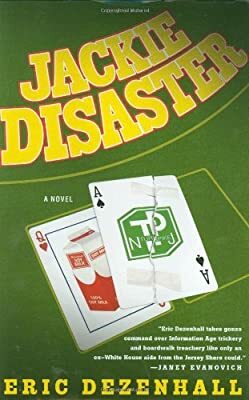 . .
From his curved-glass desk in a casino overlooking the Atlantic City boardwalk, Jackie “Disaster” DeSesto—an ex-welterweight boxing champ and former top flack for the Atlantic City Police Department—has a great view of the hustlers he now makes his living nailing. Jackie runs Allegation Sciences, a crisis management firm known for helping businesses with uncomfortably public problems. That’s why Sally Naturale, America’s deliciously loathsome doyenne of good taste and wholesome living, hires him after a pregnant South Jersey woman blames her miscarriage on Sally’s organic soy milk. Jackie doesn’t buy the poor woman’s story and, worse, he doesn’t buy Sally Naturale’s version either. His suspicions are confirmed when assassins from the Jersey Pine Barrens try to kill him one night in his sleep. So with his band of subversives (a.k.a. the Imps), Jackie embarks on a gonzo damage control campaign to vindicate Sally and catch the folks who are trying to drag him down with her.